There is nothing more mysterious and intriguing as the jungle. The verdant foliage hides beauty, discovery, and danger from the casual viewer and works to create a beamed tapestry of broken light that will wash down from the canopy to the earthen floor below. In my mind, these wild places are the province of Rudyard Kipling where ancient ruins are found, elephants bath in flowered rivers and, most profoundly, lone tigers stalk looking for their prey. 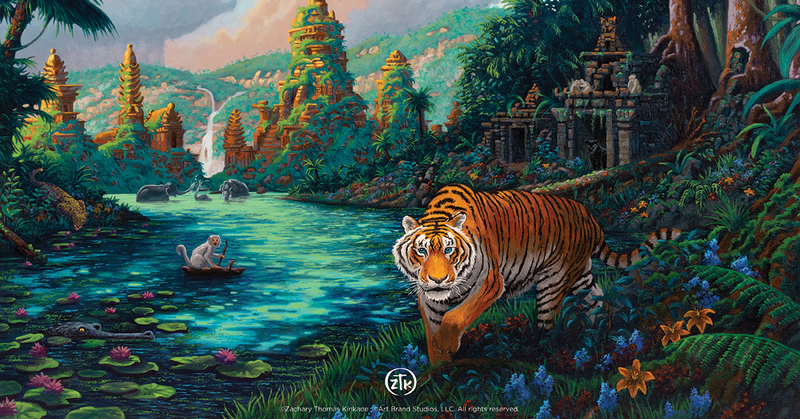 Tiger Jungle is my latest painting and a tribute to these magnificent animals and their predatory majesty. It is also the first work in a series that will explore the nature of a number of “big cats” in their natural environments. Join me in this adventure as I visit the domains of lions, snow leopards, and cougars on upcoming canvases. For now, however, enjoy Tiger Jungle and contemplate with me an old Ethiopian proverb I found to be true. “Do not blame God for having created the tiger, but thank him for not having given it wings.” As always, thank you for sharing my adventure in art.